Texaco is the petrol forecourt brand of Valero. They used to supply some Roadchef sites, but these have all been sold to Euro Garages and rebranded. They used to supply a lot of Welcome Break petrol stations. These are now Shell-branded, but at some of these there is still evidence of Texaco branding. The Texaco website states that their premium Supreme brand of fuel is supplied at these locations. 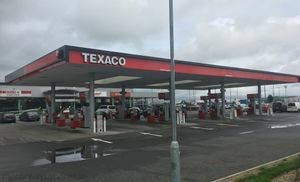 Unlike the other major operators Texaco don't have many sites with own-brand convenience store, generally choosing to use one of a selection of franchised names such as Londis, Costcutter and Mace. Of those that are self branded, the smaller forecourt snack and essentials shops are branded as 'Express Shop', while larger shops are known as 'Star Market'.